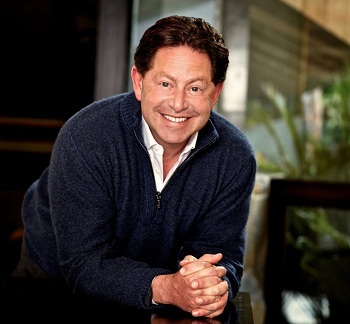 Bobby Kotick made more in 2012 than the CEO's of Walmart, Goldman Sachs and Walt Disney Co.
Update: Upon further clarification of the compensation report, Activision has explained to us that approximately $55.9 million of Kotick's reported earnings - which, as we note below, comes in the form of stock - is actually a 5-year performance-based figure, rather than a single year guaranteed sum. The number was reported on the filing because 2012 is the year in which the agreement was made. Kotick made roughly $8.33 million in actual pay last year, which falls in line with his prior year earnings. Original article: The high pay garnered by CEO's around the world is a point of fury for many people, in no small part because it tends to rise well above the wages earned by the staff working beneath them. Walmart, for instance, paid its CEO $20.7 million in 2012. Its employees, on the other the hand, would need a life span comparable to Yoda to even approach that sum. The CEO of Goldman Sachs, in turn, earned $21 million in 2012 while the CEO of Walt Disney Co brought home a healthy $40.2 million. These massive compensation packages have nothing, however, on the pay of one Bobby Kotick. The CEO of Activision Blizzard reportedly earned a whopping $64.9 million in 2012. Despite Activision's rate of growth slowing compared to 2011, Kotick's personal compensation rose exponentially. His base salary doubled, jumping up to $2 million. This was then bolstered by $2.5 million in bonus pay and another $4.4 million from Activision Blizzard's annual incentive plan. The vast bulk of his earnings, to the tune of nearly $56 million, came from stock awards Kotick picked up in 2012. Comparatively, Kotick's compensation in 2011, sans stock, was a more modest $8.3 million. Activision itself earned a net revenue of $4.856 billion in 2012, with $1.149 billion in net income. To be fair, even with a slower growth rate, Activison had a decent year, perhaps validating some of Kotick's rewards. Even so, it's always a bit of a shock to see such numbers attached to the compensation of a single person, and while Kotick was making millions game developers in the United States earned a less epic average salary of about $84,000. Granted, that's not a paltry sum compared to many other professions, but it still represents a fairly vast gulf between the man on top and the people actually making the games that Activision sells.